Olympic marathon bronze medallist Mare Dibaba won the Great Scottish Run half-marathon, with Britain's Chris Thompson winning the men's event in Glasgow. 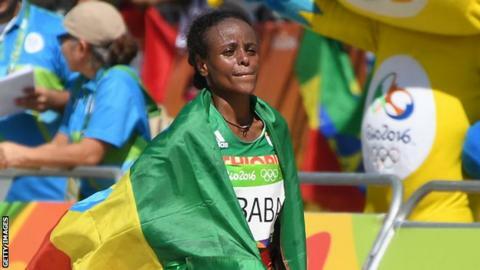 Ethiopia's Dibaba, who finished third at the Rio Games in 2016, held off Rose Chelimo to win gold in one hour nine minutes and 15 seconds. Kenya's world marathon champion Chelimo finished second in 1:10:07, with America's Alia Gray third in 1:13:32. Thompson registered a time of 1:02:07 to successfully defend his title. Poland's Marcin Chabowski was second (1:02:24), with Thompson's fellow Brit Luke Traynor third (1:02:56).